Hip Hop Karaoke NYC :: Blog: HHK Returns to Brooklyn Bowl August 7th - Native Tongues Hour and NEW SONGS! HHK Returns to Brooklyn Bowl August 7th - Native Tongues Hour and NEW SONGS! PLEASE NOTE: HHK HAS TO WRAP UP BY 12:30 THIS SATURDAY--NO EXCEPTIONS--SO DEFINITELY GET THERE EARLY IF YOU WANT TO ASSURE A SPOT ON STAGE. In case you forgot, Hip Hop Karaoke is coming back to Brooklyn Bowl August 7th. If you've never been to Brooklyn Bowl, it's a 20,000-plus square foot center that includes bowling alley, restaurant (with food supplied by Blue Ribbon), bar and concert venue. Other Guy and Wex will be going in on beer and something fried. 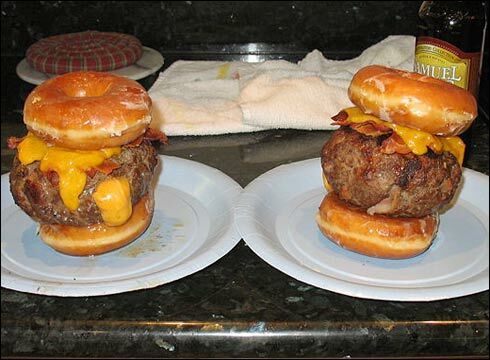 Diggedy will be in the corner by himself, quietly destroying the Krispy Kreme burger stashed in his pocket. Petey Pablo - "Raise Up"
Tribe Called Quest - "Steve Biko"
Tribe Called Quest - "1nce Again"
Tribe Called Quest - "Can I Kick It?" Channel Live feat. KRS-One - "Mad Izm"
Black Sheep - "Flavor of the Month"
Drake feat. Lil Wayne, Kanye West, Eminem - "Forever"
We're also proud to announce a special Native Tongues hour. Everyone who signs up for a Native Tongues track will be eligible for a special prize. We're not saying what it is, but trust us: you'll like it (Dee Phunk, thanks for the suggestion, but don't think too many people would be excited by your autographed head shot.) See you there. Eat. Bowl. Rap. It ain't no more to it. So I guess Doni D opening the show with Mellow Man Ace's Menterosa is not a possibility at this point huh? Tell Dee Phunk I said thanks. The price of being from Harlem. Until now My partner and i have Eighteen frames for [url=http://www.d3boy.com/]d3 gold[/url] in various kinds & colorations, gathered over Several! I in the morning which means totally captivated with these folks, everything is My partner and i bring over the cold months & contemplate some tips i have done previously games gold have become popular, they're quite model & deep.our absolute favorite is a Bailey control key, My spouse and i as well would like it if [url=http://www.hahawowgold.com]buy wow gold[/url] will make dark blue ones!Longer may possibly people stop in model! all sorts of things concerning games gold were being the things i anticipated so that i purchased a subsequent set of two unique fashion.